ARENA’s core grant funding is covered in the ARENA Act 2011, which provides the agency with $2 billion to invest in renewable energy projects until 2022. 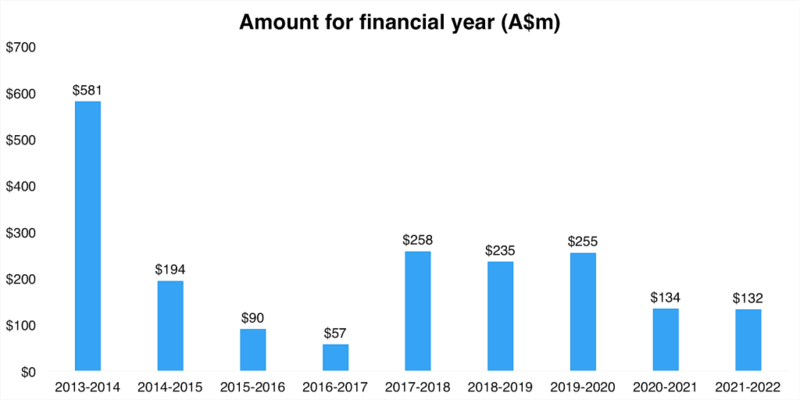 The chart below shows the funds made available to ARENA from 2013-2022. This represents total funding allocated to ARENA. Unspent funds may be rolled forward to the next year. This chart includes changes to ARENA’s funding as introduced through the Clean Energy Legislation (Carbon Tax Repeal) Bill 2013, and the Budget Savings (Omnibus) Bill 2016. In 2016, the Australian Government established the Clean Energy Innovation Fund. This fund draws on the combined skills and experience of the Clean Energy Finance Corporation (CEFC) and ARENA. The $200 million fund finances emerging Australian technologies and businesses that could accelerate Australia’s transition to a renewable energy economy. ARENA’s investment priorities are aligned to our General Funding Strategy. This overarching strategy – which is approved by our Minister – sets our guiding principles for investment [financial assistance] and outlines key priorities for a multi-year period. This strategy is the basis for our Investment Plan, our investment priorities, and ambitions for particular portfolio areas or technologies. The investment priorities are identified through ongoing internal reviews, project and portfolio impact assessments and through external stakeholder engagement workshops and consultations. The Investment Plan drives how ARENA assesses projects and makes investment decisions. Projects funded by ARENA meet their relevant funding program guidelines, merit criteria and associated guidelines.